This project involved installation of 3 flue gas condensers in parallel on their 5000 boiler horse-power boiler. Great Lakes Greenhouses is a large English cucumber producer. 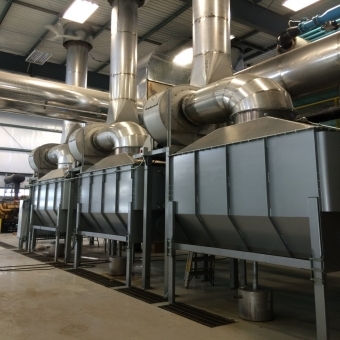 This project involved installation of 3 flue gas condensers in parallel on their 5000 boiler horse-power boiler. The condenser uses a by-product of the boiler that would normally be wasted out of the boiler stack and converts it into usable energy. It can increase the boiler system efficiency by up to 13%. Owner: Great Lakes Greenhouses Inc.